2010 is the 1600th anniversary of the end of Roman Britain in AD410 and visitors to England will have the opportunity to see a once in a lifetime spectacular event along Hadrian’s Wall. 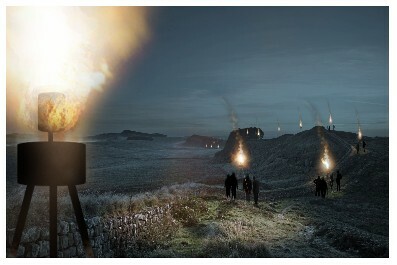 On Saturday, 13 March 2010, Hadrian’s Wall will be lit from coast to coast. “Illuminating Hadrian’s Wall” is an event to create a line of light following the route of the 84 mile long Hadrian’s Wall Path National Trail. There’ll be around 500 individual points of light placed with 250 metre intervals and public events in towns along the route to welcome the light. The first point to be illuminated will be at Wallsend in the North East, with the line of light then making its way over the following hour along the Wall to Bowness-on-Solway in Cumbria . Hadrian’s Wall was built in AD122 by the Roman army on the orders of the Emperor Hadrian. It formed the Roman frontier across the north of England for almost 300 years. The end of the Romans in Britain was one of the greatest turning points in British history, so as well as celebrating a truly iconic piece of world heritage the event also marks this hugely significant anniversary. If you’re travelling in the England in March, don’t miss this spectacular event. You can also try your luck at becoming a volunteer ‘illuminator’ for this special historical celebration. Registrations (http://www.illuminatinghadrianswall.com/site/signup/sign-up-here/) are being received up to and including 22nd February 2010 and from which the organisers will select 500 lucky applicants. Although the event will take place from dusk on 13 March 2010 and will last for around 75 minutes, illuminators would need to be available from 11am through to 8pm on that day to allow for training.